I promised I’d do better in April, and I think I have – slightly. To be honest, life has been a bit relentless, lots of stuff away from the blog that has had to take priority. Such is life, and I’d be the first person to say that blogging – something that’s a passion for me – should never become a chore. And if that means that sometimes you get fewer (but still great) posts, it’s not the end of the world. Needless to stay, I’ve still been lucky enough to eat a lot of fun, different stuff and my waistline is definitely feeling the effects. Bring on a bit of cleaner eating in May, I think! One of the highlights of April was a trip to Beefeater’s newest concept, Bar + Block, in the heart of Brum. I’d been a bit sceptical about this, but we had a fab night with some friends. 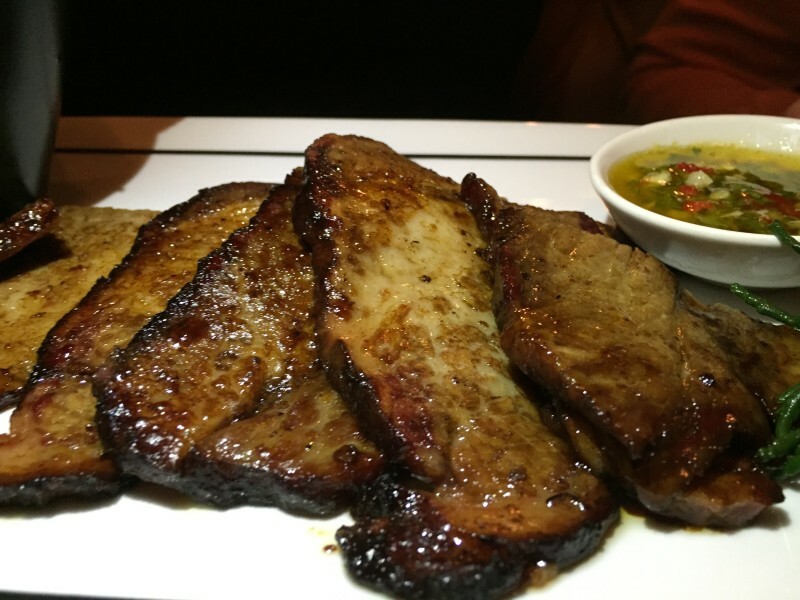 Great steak, great atmosphere, great service, and this brisket – the special of the night – was TO DIE FOR. We will definitely be back. April also brought with it a whole new world for Eat with Ellen. I made a new blogging friend, Jess from The Weekend Tourist, and we met in person at a bloggers night at The Perch in Oxford, a fab pub in Binsey, Oxford. 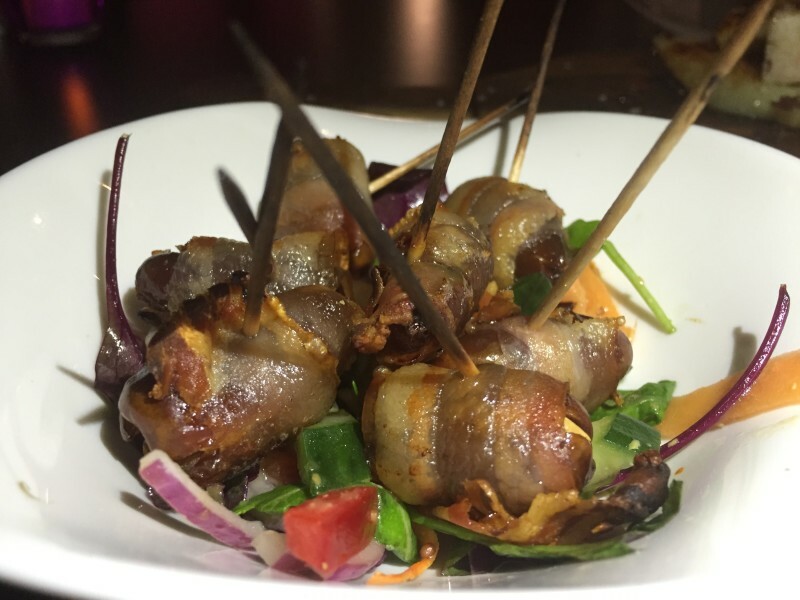 It was a new neck of the woods for me, and a chance to try their new spring menu, packed with dishes that were a bit of a welcome departure from the same things you see on lots of menus. The highest point of the month has to be my most recent post, a Laurent Perrier evening at Five Rivers in Walsall. Until I got this invite, I had no idea Walsall was hiding such a beaut of a place. 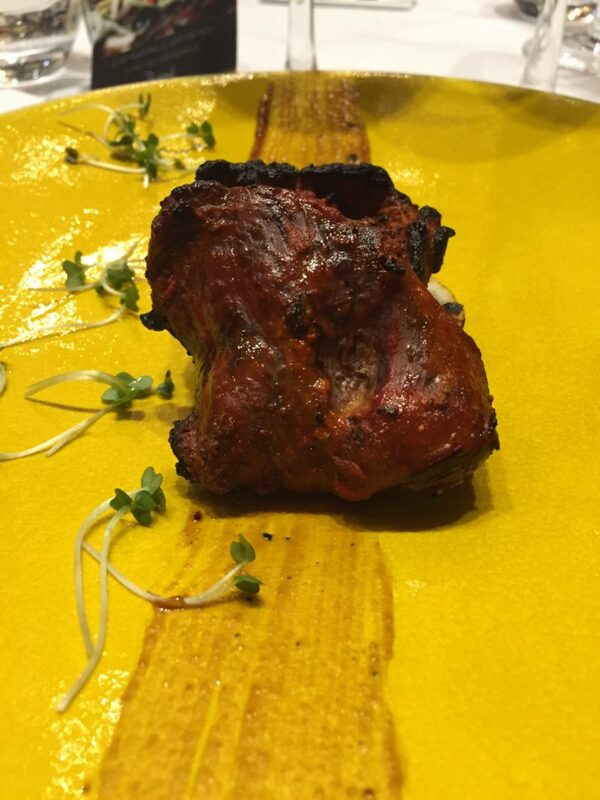 If you want Indian fine dining somewhere that’s award-winning, nationally-acclaimed, yet slightly off the beaten track when it comes to the usual ‘foodie’ places, then you simply must go here. I was lucky enough to enjoy a fabulous eight-course banquet, complete with paired champagnes and wines, which obviously knocked my socks off (and everyone else’s there). However, I have it on good authority that Five Rivers comes up with the goods consistently. Go. Seriously. I may not have blogged much about recipes and homecooked meals in April, but it doesn’t mean we didn’t cook. So for all you doubters out there, here’s proof in the form of a few snaps of some treats we whipped up in Casa Manning. Early in the month my brother came to visit. 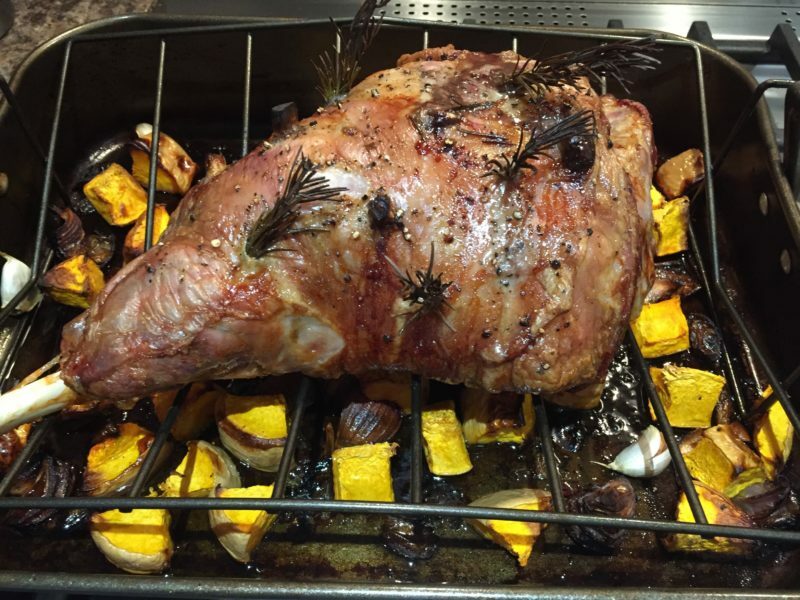 I cooked a fave of mine, roast leg of lamb with mediterranean veg. Super easy, but ever so tasty. 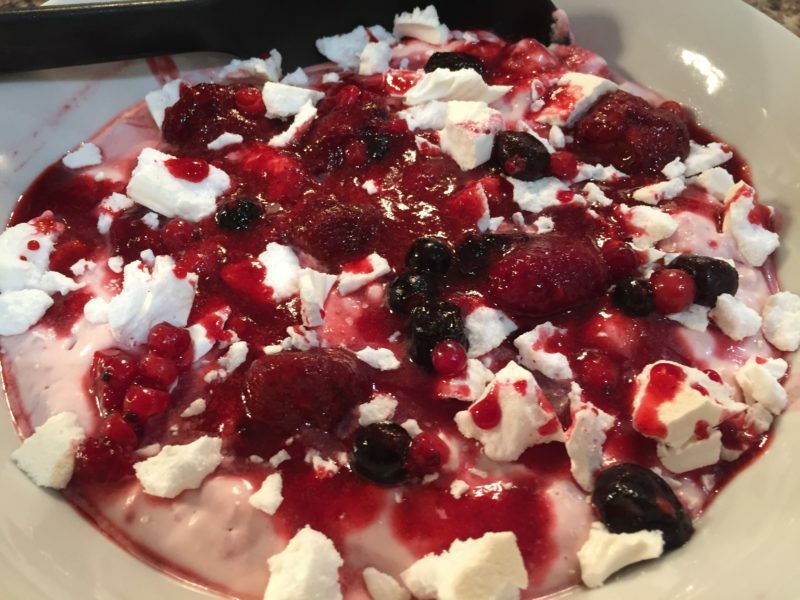 For pudding, my niece and I whipped up an Eton Mess. She’s the cooking star of the family – makes the best cakes and puddings going! Everyone likes a takeaway – although I read something recently that Brits are reducing their food bills by cutting their takeaways. Are you? Seriously, we don’t have them that often, and when we do it tends to be a curry. But we’re lucky enough to have a FAB fish and chip shop near us, that also produces some pretty darn tasty kebabs. 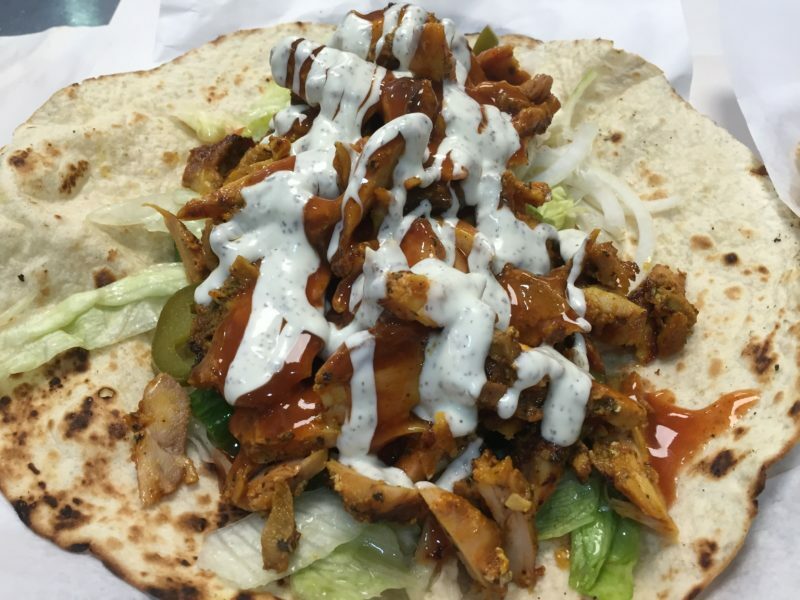 Can’t beat a chicken kebab on a toasted pitta with all the trimmings. Yes, I said that. Just cuz I blog about food, doesn’t mean I can’t appreciate the simple things in life. I’m seriously contemplating writing a full post about this chippy, it’s that good! You might remember the sun shone at a few points in April. Well, sunshine means one thing in our household – barbecue time! When we left our old house behind, we left with it the bar (yes, we had a bar in the garden) and the brick-built barbecue. 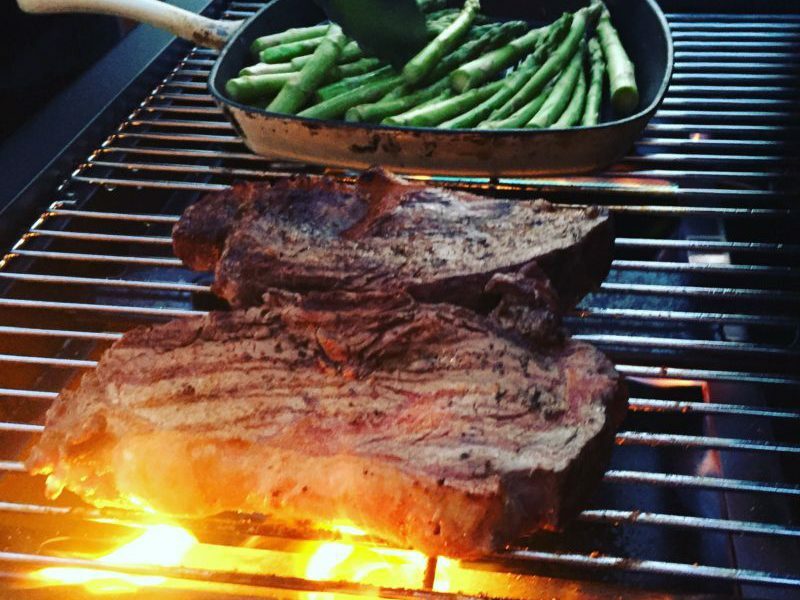 So when the sun decided to make an appearance in April, Mr M decided there was no time like the present and came home with a barbecue, two steaks, some asparagus and a bottle of vino. It may have taken us two hours to assemble said barbecue, but we ended up with a blimin nice dinner! I know you’re used to food, food, food, but you might remember that 2016 is the year of telling you about some of our adventures on the blog too. 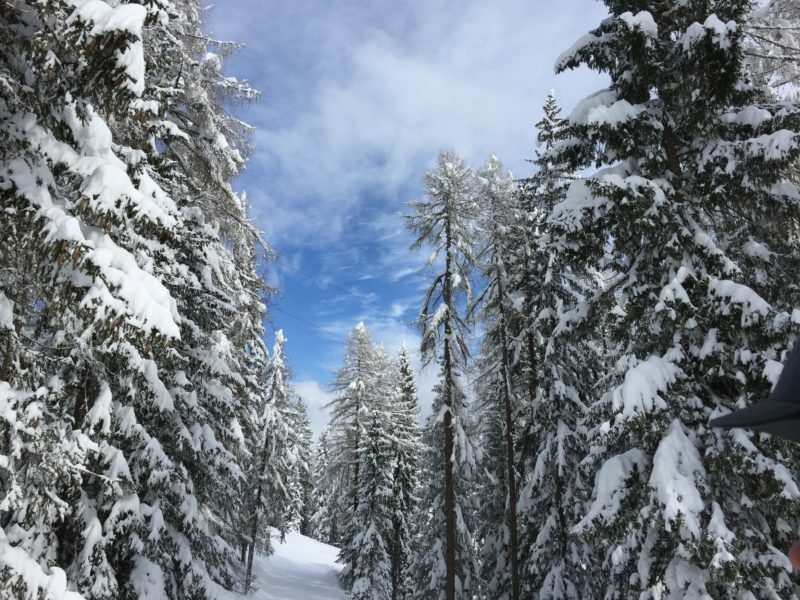 In April I blogged about our ski holiday the previous month to Cortina d’Ampezzo in Italy, so check out the post for the full lowdown on this lovely little Italian town. Plenty more travel stuff where this came from, so keep your eye on the blog over the next few months. April also saw me write a post that is (I think) my most-commented post to date. The discussion on whether it’s okay for somewhere to ban children or not was certainly lively, and I found it really interested to hear different people’s views. I have to say, I’m still undecided on what I think about it, so plenty more opinions welcome. Just pop them in the comments. Away from the blog, I’ve been plenty busy, don’t you worry. As London marathon season arrived, I rather aptly found myself featured in Feel Good You magazine talking all about how an app helped me train for my own marathon experience two years ago. The fitness theme also continued when I wrote in the Stoke Sentinel about how exercise helps me balance out all the yummy food I’m always scoffing. Needless to say, there’s plenty of stuff I couldn’t squeeze in in April, despite my best efforts, or that I haven’t yet blogged about. The Lost Society pop-up in Birmingham is on my list, and after reading fab things about Rofuto’s preview evening I definitely want to get down there. I also haven’t yet got round to blogging about an amazing food-filled weekend in London with our friends – so keep an eye out for that over the next week or so. And let’s not forget Bilbao. If you follow me on social media you’ll have seen my trip to Bilbao with my mum – I’m actually writing my post from this fab city in the Basque region of Spain – so you can expect the full lowdown soon. The diary for May is already filling up, as I’m sure you can imagine. 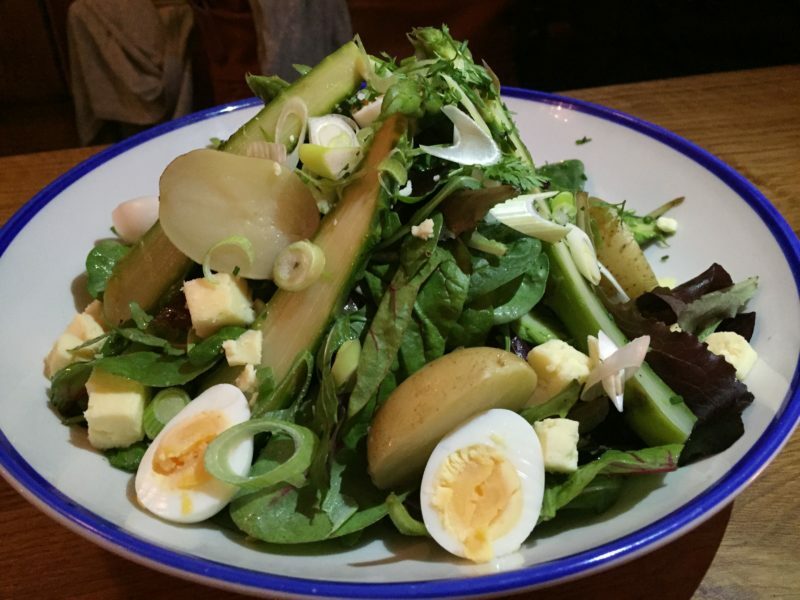 This week I’m off to The Plough in Huddlestone, Lichfield, to check out their new menu. It’s also going to be cocktail central this month, with a return to Revolution in Birmingham for a cocktail masterclass, plus the opening of new cocktail bar Be At One in Brum. I’m also going to try to pop over to Coventry, where Digbeth Dining Club is taking all its yumminess later this month. It’s been far too long since I went and since it’s so close to home, I don’t have much excuse not to. Have a fab May one and all. Can’t wait to share more food-filled adventures with you. Some of the meals I enjoyed in April were complimentary, some were paid for. Please check individual blog posts for full disclosure.